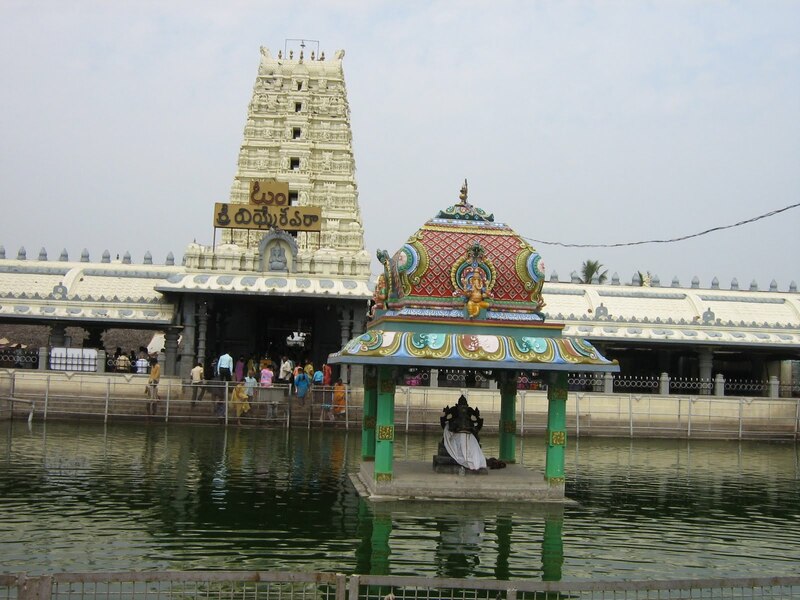 Located in Irala Mandal, Kanipakam, in the town of Chittoor, in the southern state of Andhra Pradhesh, the epoch- making Kanipakam Swayambu Varasiddhi Vinayaka Temple is situated at a distance of about 11 kilometres from the township of Chittoor. Legend has it that there was a trio of handicapped brothers, one couldn't see, one was deaf and one couldn't speak, who were cultivating the land in order to earn their daily bread. In the days of yore, water was drawn from the fountainhead, by using the 'piccota system'. One of the brothers would inundate the meadows via the channels and the remaining would dispense the piccota. One day, they discovered that the water in the fountainhead had dissolved, as a result of which it was impossible for them to continue with their work, one of the brothers climbed into the well and started digging the earth, and he was amazed to witness the iron appliance hitting a composition, which seemed stone like. He saw that blood was trickling out of it and in some time, all the water in the well had transformed into a shade of bloody red, amazed to witness this celestial site, all the brothers were able rid themselves of their handicaps.After the villagers found out about this, they crammed inside the fountainhead and began to dig deeper, however, their efforts were fruitless as the 'swayambu' deity of the supreme God, Vinayaka rose from the churning waters. Then, they prayed and provided several coconuts, bowing down before the idol and declared the ideal of 'swayambu' and offered a number of coconuts. The coconut water flowed through the channel to the distance of one and a quarter acres and the evidence of this caused a change in the utilization of the word, 'Kaniparakam' which later began to be pronounced as 'Kanipakam'.Today, also, the idol can be found in the old fountainhead as well as its springs, that are long standing and continual and during the monsoon, the water of the well is known to overflow. An astonishing quality of the deity is continues to grow. Today, we are able to view the knee and the midsection of the deity. About fifity years ago, Smt Lakshamma, a zealous follower of the Lord had provided a 'Kavacham' � armour, to Him, however now, it is unable to fit the deity as it is too small for it.The swayambu idol of Kanipakam is regarded as the defender of truth and whenever people in the village have arguments or fights, they are resolved by taking a special oath, both the parties take a dip in the reservoir of the temple and swear before the Lord, it is taken as a faithful oath. There are situations where the offender has volunatarily accepted that he is at fault as soon as he has taken a dip, even before he has entered the temple. It appears as if the Lord lawns invisibly on the offender and makes him repent and feel guilty for the wrong deeds that he has done. Thus, the grandeur of the Lord has spread far and wide and ethical courts advocate the 'special oath' in their judicial decrees. 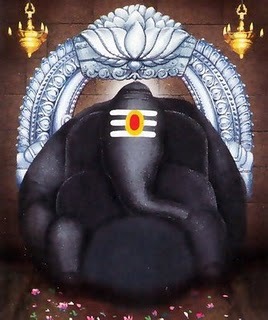 Bhamotsav is celebrated to honour Lord Sri Varasiddhi Vinayaka in Kanipakam annually. 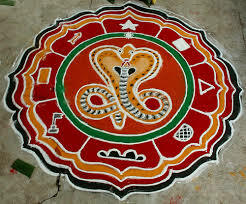 It commences from Vinayaka Chavithi/ Ganesh Chaturthi and continues for twenty days. The idol is taking out in procession in the town in different carriages and innumerable devotees participate in this event. 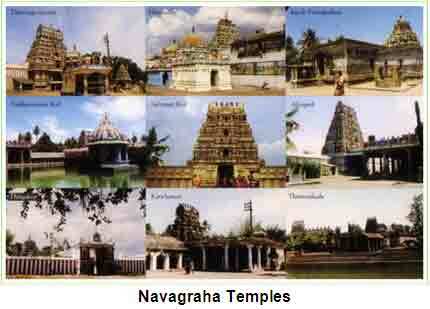 This festival attracts pilgrims from all states of the country.